POLICY DEVELOPMENT: The Cambridge Chamber of Commerce is the voice of its members, representing the business community at local, regional, provincial and federal levels. For more information on some of the policy issues currently being presented to our various levels of government, see the list below. The process for policy development is #1 Present the issue to the Chamber Board of Directors or the President/CEO. #2 The issue is reviewed by the Executive Committee who will instruct Staff on whether this requires broad stakeholder input, or an online survey. #3 Information is gathered by Staff and a policy is formulated by the Executive Committee (Government Relations and Policy Committee), along with the recommended promotion and awareness campaign requirements. For quick response issues, the President/CEO will recommend to the Executive Committee a course of action, develop concurrence via electronic communication and publish the policy position as rapidly as possible. LRT Survey Results. The Cambridge Chamber of Commerce Board of Directors recently asked the Chamber membership for their input on the Waterloo Regions Light Rail Transit project. 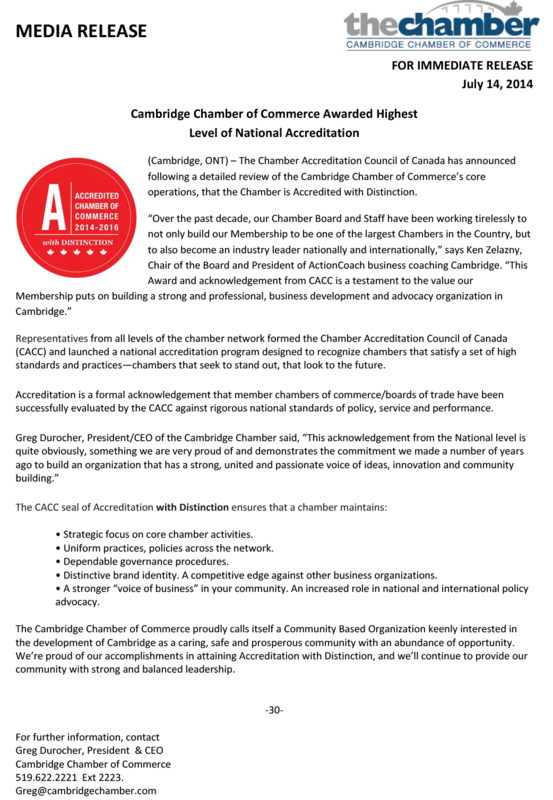 View results from the Cambridge Chamber of Commerce Membership. To view the Region of Waterloo Council approved LRT resolution click here.